Which gave him the high overall score of 8.85, highest score in the dressage phase of 9.08, and the very good score of 8.35 in the jumping phase. Diamond Stud successfully completed the 70 day test at Silver Creek Farm in 2010. Sir Gregory now has his first licensed son!!! 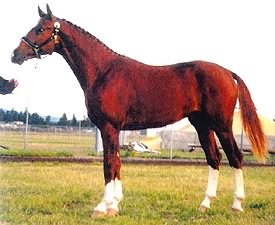 Gatsby is by the elite Hanoverian stallion, Gonzo I. Gonzo was America 's most requested Hanoverian stallion between 1995-1997. Gonzo was a successful Grand Prix show jumper, an amazing Puissance horse, topping the 7'2" wall on several occasions, and competed successfully through 4th level dressage. With athleticism, work ethic, and intelligence, Gatsby continues the famous legacy of Gotthard, Gepard, and Gonzo, proving the great value of his heritage. Gatsby is an excellent sire! He improves a wide variety of different types of mares and stamps his excellent qualities on his offspring with amazing consistency. Gatsby tends to pass on his uphill build, long legs, substantial bone and substance, his neck and topline, beautiful head, big shoulder, and strong loin connection. Not only will Gatsby typically add substance to lighter mares, but because of his modern type, he will also refine heavier mares. Gatsby’s foals tend to inherit his beautiful suspension, natural uphill balance & cadence, great shoulder freedom, and excellent canter. Gatsby, himself, is very elegant, light, sensitive, and forward and his foals are excellent movers as well. Brown Silver AQHA & NFQHA stallion by Bar U Champ Binder out of Uplands Peppy Wings. Guthrie carries 18% Thoroughbred blood. His sire, bar U Champ Binder, was the 1st silver recognized by the AQHA. 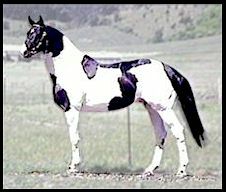 There are still only 2 known bloodlines that carries the silver dilution gene in QH's.